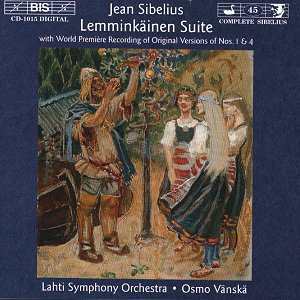 This disc is listed as number 45 in the continuing series of the complete Sibelius from the Lahti Symphony Orchestra conducted by Osmo Vänskä, and what a revelatory series it has been (not that I have heard anything like 45 discs from the series). The obvious comparison here is with the earlier BIS recording of the Lemminkäinen Suite by the Gothenburg Symphony conducted by Neeme Järvi (BIS CD 294). BIS have a policy of never deleting a CD so that should still be available, but the two discs demonstrate the progress in presentation that BIS has made in the last 15 years. The earlier disc did not even list the name of the work on the spine; simply SIBELIUS/Gothenburg S.O./Järvi which has always bugged me. Gone is that full page type-writer script that Marianne von Bahr used to adopt, now replaced by more extensive notes in a smart two-column layout in a clearer font. The earlier disc contained only the suite so came expensive at 49'24. As with the rest of the complete Sibelius series there are extensive additions, as listed above, producing a very full disc (can 79'27 be exceeded?) with early drafts so that the development of the work can be followed. BIS have always prided themselves on the natural quality and dynamic range of their recordings. This has not always been rewarding (witness the Wigglesworth Shostakovich series which incorporates a dynamic range which can only be described as extreme that actually impairs listening pleasure- also reviewed this month). The Järvi recordings from the Gothenberg Concert Hall had always been good. The Järvi Legends had a fairly close sound but a little over-reverberent in the bass, clouding detail and emphasising a constant hall rumble and, more seriously, making the bass drum severely over-dominant. I took the disc under review to a friend who has what I can only describe as a High End Hi-Fi system and we were totally captivated by the naturalness of the sound and immediately struck by its 'rightness'. The clarity of the separation of the different string divisions constantly held the attention. Having listened to the Suite we were able to declare this the finest recording we had ever heard! (see below)We had been able to totally immerse ourselves in the music and the detail of the performance, hearing it afresh and finding all sorts of echoes, or rather pre-echoes, of other Sibelius works that had slipped by before. So I can declare the Järvi recording to be totally outclassed - but what about the performance? The two run to almost exactly the same overall length but there are subtle differences. Vänskä is usually slightly faster than Järvi in Lemminkäinen and the Maidens of the Island and that pays dividends right from the opening. Just after the horn introduction the typical Sibelian tremulous, scurrying, riding rhythm in the strings and woodwind is much slower with Järvi and lacks impetus which immediately weakens the work. Järvi's Lemminkäinen seems more interested in the scenery than the maidens! The tempo differences are only slight but tell. Surprisingly, following that opening, the main climax is actually more driven by Järvi, to its benefit, although he then relaxes a little too much at the close. It is the overwhelming clarity and definition of the horns, cymbals and triangle, the more appropriate bass drum and the wider sound stage given to Vänskä that wins the day. When popped into concert performances The Swan of Tuonela is presented as a thing of beauty - but it is not. It is a piece of premonition; there is an underlying malevolence, a disturbing evil lurking in the rolling bass drum and the low harp which turns it into a spectral beauty. Vänskä's is the most affecting performance I have come across. He takes it very slowly, exquisitely moulding the phrasing, with a more distantly placed cor-anglais than with Järvi and one with a rounded softer tone. I have never heard a cor-anglais with less honk. Again, Vänskä has made me hear this piece anew. Vänskä's Lemminkäinen in Tuonela makes Järvi sound prosaic. Vänskä starts very, very slowly and maintains the mood of evil from the previous piece with waves of dark sound from the double basses moving gradually in an accelerando across the string sections with the amazing definition this recording permits. Järvi's accelerando is nowhere near so marked and I have no score to validate Vänskä's approach, but it is remarkably effective because of the supple way in which Vänskä constantly modulates the tempi. Sibelius repeats this passage again, culminating in brass chords that sound almost as if they are sucked rather than blown. This effective idea was later utilized in the second symphony. But Vänskä does not always get it his own way and in the last movement, Lemminkäinen's Return, it is Järvi who gets Lemminkäinen on his homeward journey most speedily. Once again, though, it is the Vänskä recording that allows me to hear more clearly what is happening in the orchestra instead of the more enveloping sound that Järvi was given. This is a piece of tremendous forward motion and adrenalin rush and Järvi plays it with tremendous panache. Sibelius has a tendency to pull his climaxes here and it is Järvi who reaches the more resounding conclusion but there is no doubt in my mind that it is Vänskä who wins the final honours and this recording must have a place in every Sibelius collection. In the same way that Rachmaninov's Symphonic Dances should not be dismissed but placed on a par with his symphoies so it should be with Sibelius' Four legends. 'Symphonic Poems on motifs from the Lemminkäinen myth' was Sibelius' title for these four pieces. The notes by Andrew Barnett are very comprehensive, a model of their kind and are heavily drawn upon here. The inspiration for the Legends came from the Finnish national epic Kalevala published in collection by Elias Lönnrot in 1835, revised 1849. It became a symbol of national identity for the oppressed Finns. In 1893 Sibelius decided to attempt to win an opera prize and commenced work on The Building of the Boat but abandoned it after a year and with it the influence of Wagner on his style of composition. Many of the ideas for the opera were then included in the four Legends and the overture for The Building of the Boat became utilized as The Swan of Tuonela. It was at this time that the symbolist art of Böcklin and Enckell was in fashion with their images of swans, water and death (Böcklin's Insel der Toten was the inspiration for Rachmaninov's Isle of the Dead and surely for the Swan of Tuonela as well). In none of these pieces does Sibelius attempt to provide more than the mood of the account in the Kalevala and there is no attempt at following a narrative. Lemminkäinen and the Maidens of the Island also known as Lemminkäinen and the Maidens of Saari depicts Lemminkäinen sailing to Saari and finding the menfolk are all away. He enjoys himself among the women until having to flee upon the return of their menfolk. In order to win the hand of the daughter of the Northland, Lemminkäinen has been set the task of killing the Swan of Tuonela but is himself ambushed and killed by the son of the Lord of Tuonela who cut his corpse into eight pieces and threw them into the Tuonela river. These are rescued by his mother whose magic powers then restore him back to life. After the horrors of the previous movements this is an ecstatic homecoming and was meant to encompass the pride the Finnish people should feel for their country.
" Who knows were the sound more congenial, I might have responded more favourably. Producer Robert Suff has since confirmed to me that the recording sessions were indeed dogged by technical gremlins. BIS has done its level best to 'rescue' the master tape .....etc"
This made me feel rather foolish (although I do trust my ears) until Hi Fi News also gave this disc an A rating. I contacted BIS and was told by they did have a technical problem, but the postproduction has rectified almost all of it. I was congratulated "on your thoroughness and interest and seriosity".